Statue measures about 10-inches tall on a webbed pillar base. Spider-Gwen is limited to only 1,000 pieces! Designed by Joe Allard and sculpted by Joe Menna. Is that spooky or what?! 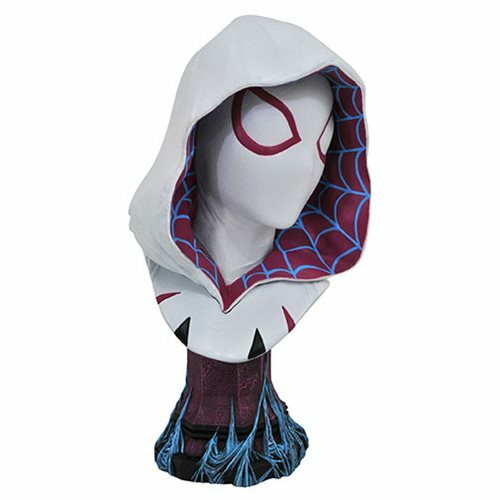 Spider-Gwen, Marvel's breakout spider-hero, slips into the Legends in 3D line as a mesmerizing half-scale resin bust measuring approximately 10-inches tall on a webbed pillar base. Gwen Stacy is limited to only 1,000 pieces and comes packaged in a full-color box with a certificate of authenticity. Straight from Earth-65, the Legends in 3D Marvel Spider-Gwen Comic 1:2 Scale Bust is designed by Joe Allard and sculpted by Joe Menna!